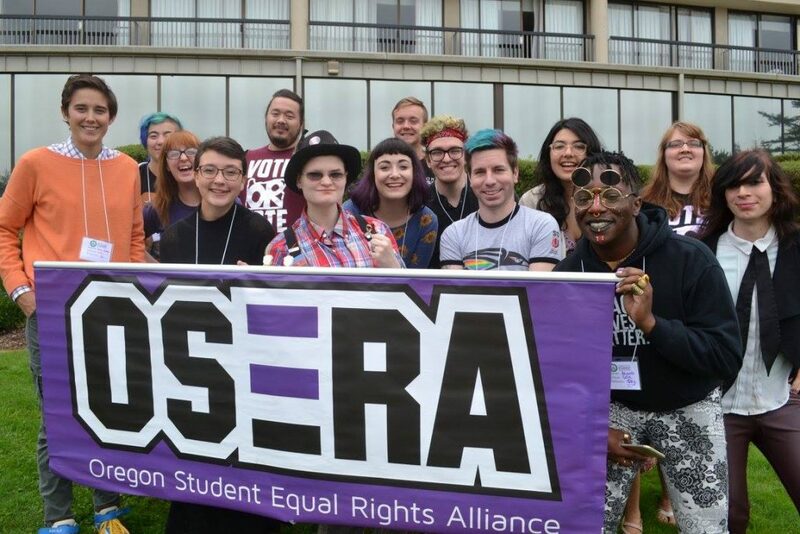 The Oregon Student Equal Rights Alliance (OSERA) was formed in 2001 at the Northwest Student Leadership Conference, with the intention of creating a statewide network of support between established campus Lesbian, Gay, Bisexual, Transgender, and Queer (LGBTQ) associations, as well as pooling resources to establish new LGBTQ associations across the state. However, it became clear that OSA as a whole needed a more concerted way to provide leadership development to underrepresented communities and ensure our legislative agenda was representative of the issues facing students from the LGBTQ communities. In 2011, the first Equal Rights Organizer was hired, securing institutional staff support for the board. In the past, OSERA has worked to implement a campus climate survey and inclusive policies on campus. Due in large part to our partnership with Basic Rights Oregon (BRO), OSERA’s first year of major legislative success came in 2006-2007. After an almost 30-year fight to gain basic rights for LBGTQ Oregonians, Oregon passed domestic partnership legislation and a non-discrimination policy that includes protections based on gender identity and sexual orientation. In 2009 OSERA worked with BRO and other organizations to pass the Safer Schools Act; strengthening anti-bullying policies in K-12, where LGBTQ students are disproportionately targeted for harassment, violence, and oppression. OSERA now works to lobby and organize at the state capitol for pro-equality legislation and on campuses for pro-equality policies. OSERA also works to educate and engage other students and student groups on queer and trans issues relating to access to higher education. Through such work, OSA has been able to deepen its commitment to social justice.